When my children were younger I wanted to share the cycle of life with them in a real way. I wanted them to be able to see, feel, experience how the circle of life really works. I purchased some worms, (red wigglers), and purchase a box that would allow earthworms to procreate, as well as eat all the garbage that we generated. We would put our shredded papers in the box, coffee grounds, and the filter, apple cores, banana peels, and various other food in our worm box. We had our worm box outside. I have read that some people keep their box in the home. NO! When my son was 18 months old, he would take all the daily refuse for the worms to the box. The box did not smell bad, since they eat the bacteria that generates the odor from the food. What does smell is the poo from the worms. Every couple of months we would have to clean out the box, and that wasn’t a fun job. We would separate what was the “black gold” from the garbage, and save the worms. We would then have another generation of worms, and we add the black gold into our garden. We grew some of the biggest pumkins on the block, and then when we were done with Halloween, the worms had their favorite food. Honestly, after having these creatures in our life all these years, I can tell you with confidence that they love mellons, pumkins, etc. To this day we still have a worm farm, and we still feed our worms. Some of them are from the same parents we started with more than 18 years ago. This is the newest edition, it has layers, after a few months, we take it apart and sort out the gold, and start all ove with new food. This system ensures nothing goes to waste. We dont like waste doing nothing, we want to make the most of it. With all this crazy, wonderful rain, we have to move the goats to the stalls. This is also the time of the year when most of the females are looking VERY pregnant. They love hearing me walk near the stalls in the morning, because that means one thing…FOOD! Nothing ever goes to waste around here. After we have had the apples for a weekend, we take them back to the farm. The miniature donkeys and the goats enjoy the apple treat. I usually have to hold on to the apple to get them to get the apple started. After a few bites, they are good to go on those apples. Anything that is not good to give to the goats, or miniature donkeys goes to the worm farm or the compost pile. We are trying to make our vineyard as sustainable as possible, as well as our farm. Gardening with your children is a special time in their lives. We studied plants, animals, art, and science outdoors. When my sone was 18 months old we invested in a vermicomposter. We got the plastic bin, and a couple of days later we got our worms. Red wigglers, then we added newspaper, that we had shredded. The newspaper was wet, and then we added apple cores, and coffee grounds. We have had the vermicomposter all these years to show the children they don’t have to throw everything in the trash, there is a better way to dispose of our garbage, and it will go back to the earth. These same products that we bought at the store, will help bring life to our new plants. We used our “black gold”, the material that had been digested by the worms, for the plants. We planted pumpkins, tomatoes, basil, lavender, rosemary, beans, strawberries, peas, and marigolds. We planted our seeds, watered them, and the kids would draw and paint pictures of their growth. We had an animal that was eating our strawberries, so we looked up the footprints of the animals to try to identify what animal was coming into the yard and devouring our berries. 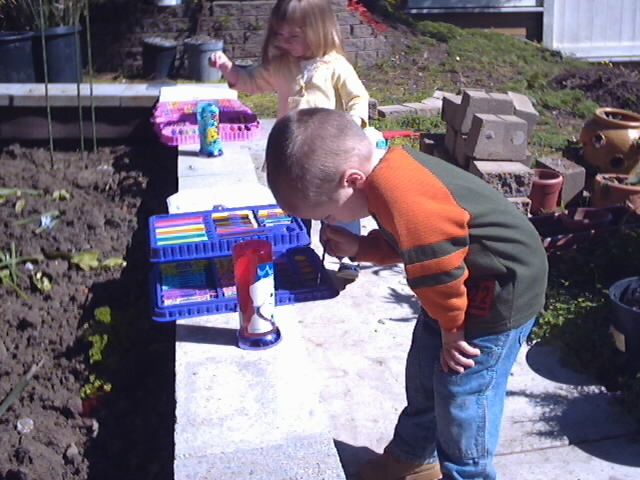 We also did science experiments outside as often as we could. We would research where the ants were coming from, and how much water it took for the ants to start carrying the eggs to the surface. Where did the ants want to take their eggs? What kind of tiny insects are on the leaves? We also purchased ladybugs and released them in the yard. Counted how many stayed, and for how long. We also purchased praying mantis, and then would track them too. I also allowed the children to take their own photographs. Even when they were very young they loved to take photos and show me what they discovered. What is in your back yard? Within a few weeks we had three injuries. Our miniature donkey, Ellie, got horned by one of the goats. A horn went through her temple. We called out Dr. Steve, and when he came out the first time, I could not catch Ellie. She ran all over the pasture. I even took carrots out to her, but she was too smart. Dr. Steve has given her shots before, so getting near her with him at the farm was a no go. Dr. Steve finally told me…Kimberly, I have another appointment. I’ll swing back by around three. I finally caught her, and put her in one of the stables. He came back, gave her a shot, and cleaned, and added a paste to her wound. The next week Salem escaped the stall where he and his brother live. He gashed his chin open, so Sabrina had to take him to the vet. Dr. Steve only takes care of “horns and hooves”, so she drove Salem to the vet to get stitches. He had to wear a cone for a week. The very next day, Gucci went to doggie day spa. They discovered a growth on her hind leg. I picked her up from the spa that even and took her to the emergency vet hospital. She was in a cone for three days. One of the days she acted as “winery dog” for the day. Everyone is on the mend, and doing much better! When life gives you sh*t, you make compost. Farm life isn’t always about the cute animals, they have a lot of crap. We compost all our garbage, and even the poo. Nothing, really goes to waste. LOL! Not only do we compost, but we also have a vermicompost. What is vermicompost? So, we have been utilizing this system since our eldest child was 18months old. We wanted our children to understand the cycle of life, as well as start them young with finding an alternative to the landfill. This is such a great way to incorporate your shredded paper, coffee grounds, apple cores, banana peels, etc. I don’t mix the two systems. The animal waste products and the vermicompost. The bigger pile has to be rotated, and it takes about a year to use in the garden. So, it may not be pretty, but it is a part of farm life. Sustainable practices like our grandparents and great grandparents used as they farmed. Caring for the land, and not striping the land. Every living thing is important, including the worms.